Jack: I want to pursue education in mass communication but my mom does not like the idea. I am not sure if I should follow my heart of compromise to what my mother wants me to study. Pepe: We get a lot of challenges from fellow students who come in our classrooms to borrow writing materials. Most of the students come to school not prepared. Peer pressure has caused three of my school mates to be gunned down by police in 2011. The peer pressure also has made some students to indulge in drug and substance abuse. I also worry a lot about life in general. Wamboi: Time management has been a challenge to me. I also experience lack of text books because our school does not provide us with books. Davin: Most of my fellow students do not use their time well. They need a place to go such as a library and a tutor to help them in their weak subjects like mathematics and sciences. I also lack concentrating in class and I am sometimes occupied with thoughts about food. Lydia: I always forget where I normally put things like writing materials, it worsened to the point of spending the entire class lesson looking for my pen. I also find it difficult in understanding geography subject. Fridah: I have reduced my carelessness in school but at sometimes, I forget where I place my items in school. I sometimes get confused about everything in a day and having a negative attitude towards certain subjects. I also pray to stand on things on my own instead of following the crowd. Sam: I sometimes get kicked out of classroom for not having writing materials and geometrical set. Please keep these students in your prayers as they take one step farther in getting a good education. We hope everyone had a wonderful Christmas and a happy new year. In the chaos of the holidays and a new school year starting, I am just now sitting down to update you on the unbelievably successful art camp that took place at the end of last year. The camp was in northern Mombasa at a school called SHIMO LA TEWA HIGH SCHOOL. We left on the Friday of 25th November night and returned on 30th November morning. We had a total of 92 people comprising of 24 volunteers (four Americans, one German and 19 Kenyans) and 68 kids. Our biggest yet! This time around, we decided to involve all the children in all the four forms of arts (drama, mural, poetry and HIV/AIDS class) that we were teaching. After breakfast, devotions and assembly each morning, the children attended classes in each subject. 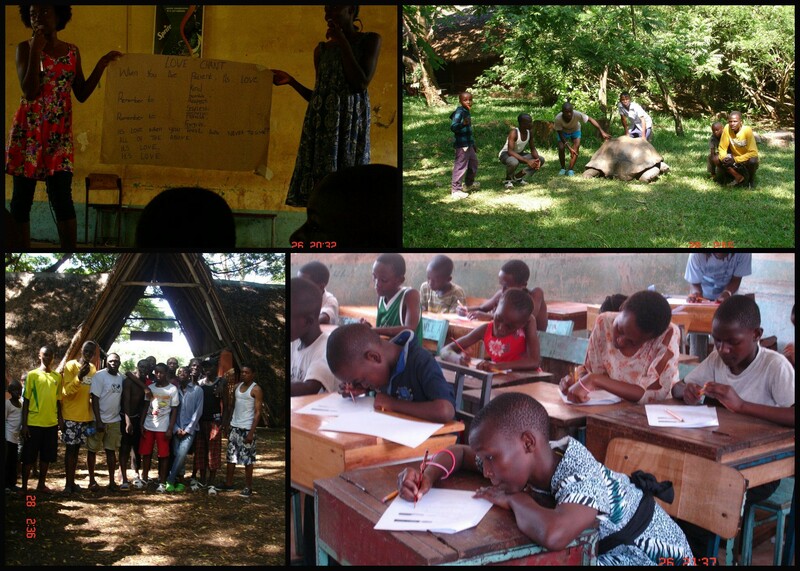 At the end of the camp, each student had attend classes in drama, mural, poetry, and HIV/AIDS education. In the afternoons, they were able to visit the beach and the Haller Wildlife Park. This year’s theme was love, and through various artistic lessons, Inspiration Center kids explored the theme. For example, in mural class, students learned the concept of shading with pencil, and then worked on collaborative murals which depict four heroes whose lives reflected love: Mother Theresa, Gandhi, Wangari Maathai, and Salim (an eight year old boy who passed away earlier this year). Sophie has not been gong to school for almost a year now. though and is hopeful she will go to school and write poems like her friends. Thank you to everyone who helped make this possible, from our wonderful volunteers, to our sponsors and donors. We couldn’t have done it without you!